From an economic perspective, insurance is useful to protect against low frequency, high severity events. Quite simply, we are well served to insure infrequent events that would be financially devastating like the loss of a home to fire or an untimely death. This ultimately begs the question of why people purchase insurance to protect against damage or loss of a $400 phone but often fail to insure something worth more far more than their home or cars – the loss of future wages as the result of a long-term disability (LTD). Long-term disability is arguably the most critical risk for a young or mid-career professional to insure. As we outlined here, the human capital of a well-educated worker is often worth millions of dollars and dramatically exceeds the value of any financial assets. A long-term disability could quickly take this asset from a value of several million dollars to zero. Forget the utility of insuring a $400 phone; it is naïve for a well-educated person to spend time worrying about potential losses in a financial portfolio before devoting time to adequately insure the risk of long-term disability. In addition to long-term disability being the most critical risk for young professionals, LTD insurance may be the most overlooked and underutilized form of insurance. Numbers support this case. According to the Social Security Administration, more than 25% of today’s 20 year-olds will become disabled before age 67 and yet only 32% of the workforce has private disability insurance. Additionally, fewer than 5% of disabling accidents are work-related meaning that workman’s compensation is not a source of reliable financial protection. Perhaps the sticker shock of disability insurance or the complexity relative to something like life insurance discourages workers from purchasing coverage. It might simply be a lack of education on the likelihood of a long-term disability and the financial threat it would impose. Whatever the case, it ought to be one of the first forms of insurance that young or mid-career professionals purchase. There are generally two routes to obtain long-term disability insurance: buy through a group/employer or purchase individual coverage through an agent. The differences between the two are significant. As explained below, the underwriting process is more complex for individual LTD policies but there are clear benefits relative to group coverage. Group LTD insurance is offered by many large employers as a company-provided benefit or can be purchased with pre-tax dollars as a payroll deduction. Many large associations offer the same kind of group insurance. For example, the American Dental Association provides group LTD insurance to dentists and the American Bar Association to member attorneys. Many people will be drawn to group coverage because of the ease to obtain but could later learn that it fails to provide the desired protection. Below we highlight the important differences between group and individual policies so that those in need of disability insurance can make an informed decision about how to purchase. Cost – Group coverage tends to be dramatically cheaper than individual coverage. Admittedly, the simple comparison of group to individual disability insurance is not fair because of the differences addressed below but group policies are much friendlier on the budget. As an example, I compared the costs of a group policy and an individual policy for a healthy 35-year old. Both policies provide the same monthly benefit and waiting period and I factored in scheduled rate increases on the group policy. Assuming a discount rate of 6%, the individual policy is 2.5 times more expensive the group coverage over the next 25 years. The difference in cost is huge. Underwriting – It is the lack of underwriting that makes group policies favorable as most group plans provide guaranteed coverage at a set price based on age. This is a huge benefit for people who would have trouble purchasing affordable coverage via an individual policy because of poor health or other conditions. The lack of underwriting is also beneficial for people who participate in “extreme sports” such as snowboarding, rock climbing, or mountain biking as these activities would result in higher premiums in individual policies. Convenience – In keeping with the limited underwriting, group insurance is often provided without any of the exam or lab testing required for an individual policy. Group coverage usually requires only a simple questionnaire. Moreover, group policies tend to be automatically billed each month whereas individual policies apply an additional charge for the convenience of automated monthly billing. No Gender Discrimination – Individual policies are more expensive for women than men based on a higher probability of claiming disability in the future. 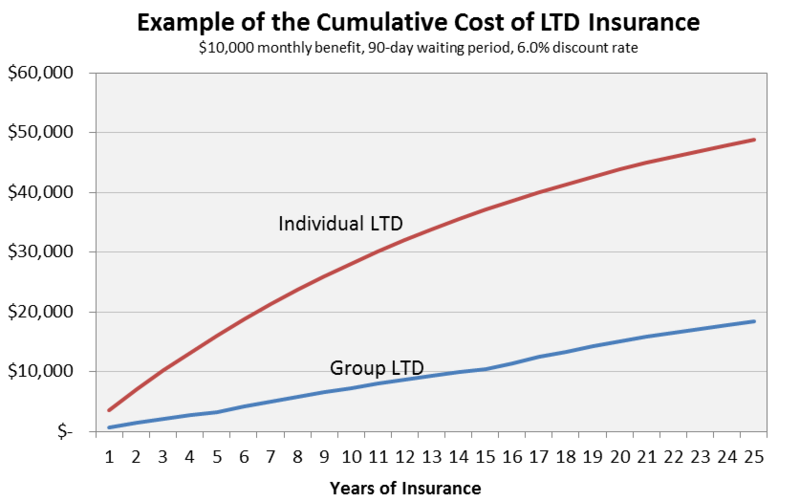 Group LTD insurance charges identical premiums for women and men, which provides a small benefit to women purchasing group coverage. Tax Deductible Premiums – Group disability insurance purchased through an employer is paid for with pre-tax dollars making the premiums tax-deductible. It is true that any future disability benefits would then be taxable but you’re getting a definitive tax deduction in high income years versus the possibility, with an individual policy, of a tax free benefit in lower income years. Portability – Group insurance is not portable. Leave the employer or association which provides the group coverage and the coverage terminates. Individual policies are portable. Definition – Group LTD insurance generally has a narrower and more limited definition of disability. Group coverage often may define disability as the inability to work in the same occupation for the first two years (“own occ”) and thereafter the inability to work in any reasonable occupation (“any occ”). The disability must then be so severe to prevent the claimant from working a cash register, for example. Individual policies generally provide a much more liberal definition of disability. These “own occ” individual policies trigger insurance payments if you cannot work in your occupation, even if you are working in another occupation. COLA Option – Individual LTD insurance allows for a cost of living adjustment (COLA) as an optional rider whereas group LTD does not. The adjustment does cost extra but may be a valuable feature for individuals worried about the impact of inflation on future benefits. Renewability – Group plans can be cancelled by the insurance carrier or rates can be increased across all participants. Alternatively, individual policies provide the option for guaranteed pricing (“non-cancelable”) where the insurer cannot change the premiums. The historic likelihood of rate increases or group cancellation is low so this difference in policies is generally not a huge deal. Offsets – Group LTD payouts are generally reduced (offset) by related payments from workers’ compensation and Social Security disability payments. This is not true for all individual policies.